Vitamin A is a key skincare active that speeds up the natural exfoliation process, refining the skin to reveal younger, plumper, healthy skin cells. This oil-free complex absorbs deeply into the skin where it works to stimulate cellular renewal and regeneration. This process smooths the skin, reducing fine lines and wrinkles, repairing the damage caused by the sun, acne and ageing. Healing chamomile calms the skin and nourishing shea butter soothes and protects, leaving your skin feeling softer, smoother and more youthful. Especially good for problematic skin, including sun-damage and acne. Important Note: This product contains Retinol; Limit sun exposure after application and do not apply near eyes. Do not use during pregnancy or while breast feeding. Reduce fine lines & wrinkles, repairs damage caused by sun, acne & ageing. INGREDIENTS : Purified Water (Aqua), Cyclomethicone, Glycerin, Polyglyceryl-4 Isostearate, Cetyl PEG/PPG-10/1 Dimethicone, Dimethicone, C12-15 Alkyl Benzoate, Retinyl Palmitate, Retinol, Sodium Ascorbate, Tocopherol, Butyrospernum Parkii (Shea Butter), Caprylic /Capric Triglyceride, Hexyl Laurate, Bisabolol, Gualazulene, Chamomilla Recutita (Matricaria) Flower Extract, Alchemilla Vulgaris (Lady’s Mantle) Extract, Passiflora Incarnata (Passionflower) Flower Extract, Hypericum Perforatum (St. Johns Wort) Flower/Leaf/Stem Extract, Hydrogenated Castor Wax, Microcrystalline Wax, Magnesium Sulfate, Disodium EDTA, Chlorphenesin, Dehydroacetic Acid, Benzyl Alcohol. 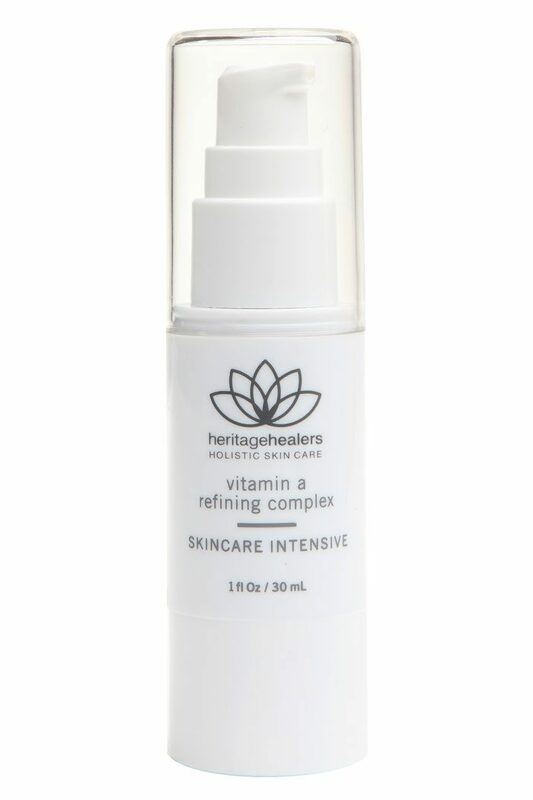 Best used alone, (or with the Vitamin C) as an alternative serum to the Botanical Bio-peptide Concentrate and Face Firming Complex as a short intensives course. Apply daily, morning and night after cleansing. When using both serums, apply vitamin C serum in the morning and vitamin A refining complex at night.